Old Burslem the mother town of the Potteries. 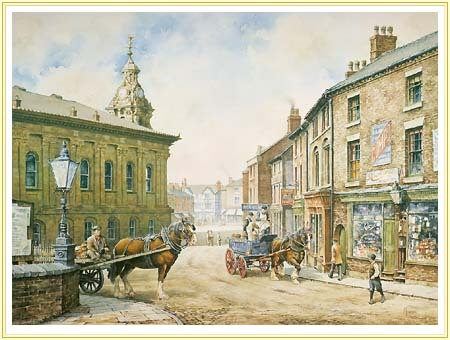 A brewer's dray begins the day's deliveries with a clatter of horseshoes sparking the cobble stones in the sunlit square beneath the town hall clock. Heavy with barrelled ale from from Parker's Burslem Brewery it stops under the sign of the "Bunch of Grapes" Public House.